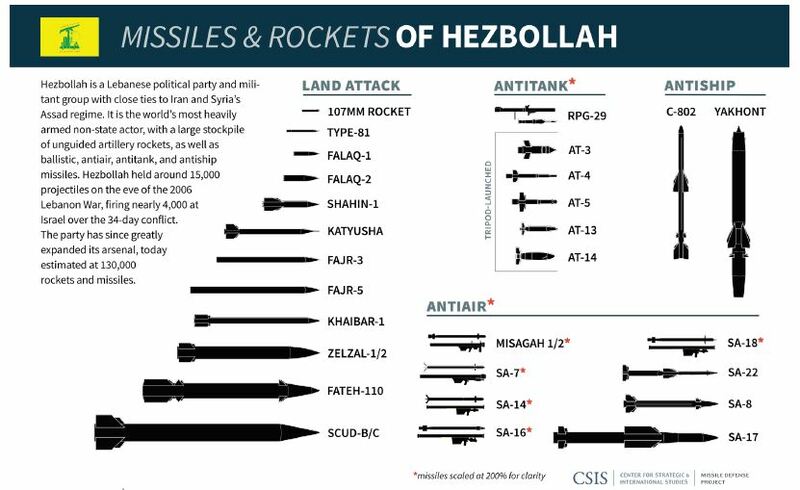 Last week the Center for Strategic and International Studies (CSIS) published a brief about the militant group Hezbollah’s arsenal of missiles and rockets. CSIS briefs are meant to serve as digestible guides for explaining global security topics. The report titled Hezbollah’s Missiles and Rockets: An Overview was co-authored by the researchers Shaan Shaikh and Ian Williams. It runs 12 pages long and provides a convenient illustrated chart of Hezbollah weapons followed by entire sections devoted to the group’s rockets, missiles, and anti-aircraft defenses. The report should appeal to anyone with a strong interest in the problems besetting the Middle East and is available as a free download. As its title indicates Hezbollah’s Missiles and Rockets: An Overview isn’t an analytical treatise about the inner workings of the notorious paramilitary group from southern Lebanon. Its authors’ goal is to inform readers about the kinds of long-range conventional weapons deployed by Hezbollah, who are recognized as the strongest non-state army in the region. And rightly so–when it comes to “dumb” rockets, the report claims “130,000 rounds” are stockpiled in clandestine armories, ready for use against Israel. 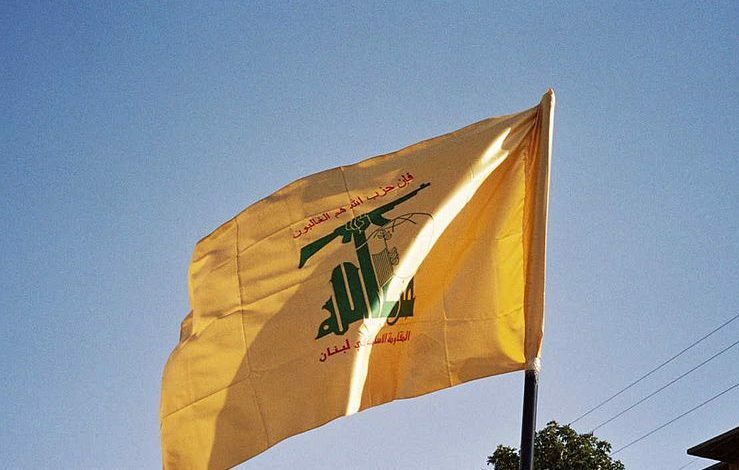 The authors believe there are 12 types of these unguided ordnance in Hezbollah’s possession with the bulk comprising Chinese and Iranian 107mm rockets that are meant to be fired via improvised tube launchers. Since the 2006 war with Israel, however, the authors note how Hezbollah received fresh deliveries of long-range rockets from their patrons, including two types that may be considered ballistic missiles. These long-range rockets were all supplied by Iran and include the Fajr, Raad, Khaibar, Zelzal, and Fateh-110 in quantities ranging from dozens to hundreds. Both the Fajr 3/5 and the Raad 1/2 are Iranian copies of Soviet 240mm and 220mm rockets. The Fajr is also spelled Fadjr by other sources and it’s suspected to be a copy of a North Korean rocket. Iran’s own military forces, the Artesh and the Revolutionary Guard, have Fajr 5’s in specially modified trucks and these are some of the most lethal multiple rocket launchers in the Middle East. But Israel’s zealous defense ministry has every reason to be worried over the Khaibar 1 and the Zelzal 1/2. The former looks like it was based on an advanced Chinese heavy rocket artillery type while the Zelzals are modified Iranian variants of Soviet Luna battlefield rockets. The Zelzals in particular were used by the Houthis in Yemen to launch repeated attacks on Saudi Arabia since the middle of 2015. The CSIS report doesn’t mention it, but both Khaibars and Zelzals threaten the entirety of northern Israel. The Fateh-110 short-range ballistic missile is the worst Hezbollah has to offer because its 300 km range means it can reach Jerusalem. There aren’t any reliable sources on how many Fateh-110’s are in Hezbollah’s armories by now, but since 2013 Israeli combat aircraft have flown sorties into southern Syria to neutralize stockpiles of these dangerous missiles. The report identifies Scud B/C’s as well yet can’t exactly pin these on Hezbollah since they’re difficult to transport. A genuine revelation in Hezbollah’s Missiles and Rockets: An Overview are the anti-ship missiles the authors believe were gifted by Tehran and Damascus to Hezbollah as a deterrent against a naval attack by Israel. One is the Iranian Noor missile, based on a Chinese design, that was used on an Israeli patrol boat in the 2006 war. The other is the Russian P-800 Yakhont supersonic cruise missile on a truck, which is really bad news. When the report covers anti-tank missiles, the contents are hardly surprising. Hezbollah does keep substantial quantities of Soviet and Russian anti-tank missiles and a bothersome stockpile of RPG-29’s or their Iranian copies. What gets left out are mundane weapons like the RPG-7 and 73mm, 84mm, and 105mm recoilless rifles Hezbollah have shown off in public. The assuredly limited number of US-made BGM TOW (or their Iranian clones, the Toophan) Hezbollah have acquired weren’t included either. The final section of Hezbollah’s Missiles and Rockets: An Overview deals with anti-aircraft defenses and what it reveals is a potential headache for Israeli war planners. The authors are convinced Hezbollah’s MANPADS (the Iranian Misagh plus the Russian SA-7, SA-16, and SA-18) are plentiful enough to knock out any low flying aircraft creeping on their secluded bases. Equally bothersome are the authors’ suspicions that Tehran orchestrated transfers of short and medium-range Osa, Pantsyr-S1, and Buk-M2 SAMs to their favorite proxies in the last dozen years. The ultimate takeaway from reading Hezbollah’s Missiles and Rockets: An Overview is the group are a grave threat to Israel and its arsenal is now on par with some conventional armies. This is absolutely true and what the report doesn’t cover are the APCs, assorted anti-aircraft guns, howitzers, and tanks Hezbollah have amassed from the Syrian civil war. But readers looking for an in-depth history of the group should try other material such as 2011’s Hezbollah: Background and Issues for Congress.